This is a preliminary assessment of the Dairy Revenue Protection program based on the information available at the time of publication. Additional information may be added or updated as the program becomes available to producers on October 9, 2018. Dairy Revenue Protection (DRP) is an insurance program administered by the USDA under authority of the Federal Crop Insurance Act. DRP is a voluntary risk management program designed to protect dairy producers against declines in quarterly milk revenue below a guaranteed coverage level on a producer declared milk production quantity. Premiums are due at the end of the quarter being insured rather than paid as an upfront cost once the coverage begins. The Government will subsidize the premiums at a rate dependent upon a producer’s declared coverage level. DRP can be used in conjunction with agricultural support programs such as Margin Protection Program (MPP) as well as a complement to numerous exchange-traded products and risk management strategies available. Enrollment for the DRP program begins on October 9th. The first quarterly insurance period available for purchase will be Q1 (Jan-Mar) of 2019. Through December 15th, 2018, a producer will have the option to purchase coverage for five consecutive quarters, beginning with Q1 2019 and ending on Q1 2020. On the 16th day of the last month in a quarter, sales for a nearby quarter end while sales begin in the next deferred quarter. For example, on December 16th, sales for Q1 2019 are no longer available while sales for Q2 2020 begin. Premium payments are due upon the conclusion of the quarterly period being covered. DRP will not be sold on days where monthly USDA Milk Production, Dairy Products, and Cold Storage Reports are released. Milk or dairy prices that experience a limit up or down move in the futures markets will not be available for determining the quarterly expected revenue, thus DRP will not be sold on days with limit moves. DRP offers two unique pricing options: a Class Pricing option & Component Pricing option. The pricing options are designed to allow producers customization of their price elections to more accurately reflect their price risk. Every producer has the ability to choose which pricing option is a better fit for their price risk, comfort-level, and ultimately the dairy operation as a whole. The Class Pricing option uses a weighted average of Class III and Class IV milk prices, declared by the producer, as a basis for determining coverage and indemnities. The Component Pricing option uses the component prices of butterfat, protein and other solids as a basis for determining coverage and indemnities. Under this option, the butterfat and protein test percentages are declared by the producer to establish their insured milk price. are no minimum or maximum volume requirements on covered milk production, and multiple quarterly coverage endorsements for the same quarterly insurance period are allowed, although they cannot cover the same milk. In this way, a producer may make elections that vary by coverage levels as well as by milk pricing options. The amount of declared milk production, among other factors, will be used to determine premium cost and final revenue guarantee for each quarterly coverage endorsement under the DRP program. Quarterly insurance coverage levels will be available from 70% to 95%, in 5% increments. This coverage level determines the final revenue guarantee that a producer will receive on their covered milk production. The magnitude of the government subsidy paid towards the program’s quarterly premium is also determined by the producer’s elected coverage level. A producer does not directly choose their premium subsidy under DRP, rather, the subsidy is dependent upon a producer’s declared coverage level, as illustrated in Figure 1. This will be used to calculate the final revenue guarantee on their Q4 2019 quarterly coverage endorsement under the DRP program. Premium costs here are arbitrary and do not genuinely reflect DRP premiums. The net price floor set by a producer’s quarterly coverage endorsement equals their minimum pay price minus the premium paid, which would then be multiplied by the covered milk production to find the policy’s final, premium-adjusted revenue guarantee. Notice the nature of the relationship between coverage level and subsidy received. This inverse relationship represents the tradeoff between final revenue guarantee and magnitude of a premium’s subsidy. The greater the government subsidy on the premium, the lower the final revenue guarantee, and the higher the ‘deductible’ on the quarterly insurance coverage. 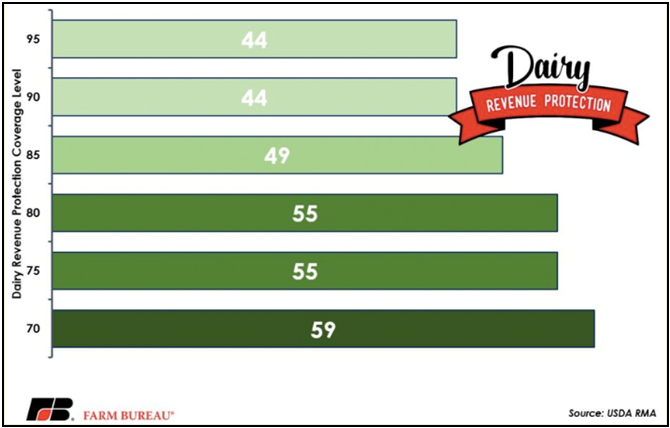 How Does DRP Relate to My Revenue? Dairy Revenue Protection provides protection from a decrease in the final milk revenue and a producer’s actual revenue on a specific producer-declared quantity of milk production. The discrepancy between the guaranteed quarterly revenue level under the DRP program and a producer’s actual milk revenue on this milk production is caused by variation in market prices over time and natural fluctuations of milking cow yields among states and pooled production regions. The Class Pricing option uses a blended Class III and Class IV milk price, based off average butterfat and protein test values of 3.5/3.0, as a framework for determining coverage, premiums, and indemnities. Under the Class Pricing option, a producer declares their Class III price weighting factor between 0 – 1.00. The default Class IV weighting factor is then 1.00 minus the producer-declared Class III weighting factor. For example, if a producer declares a Class III price weighting factor of 0.50, then the default Class IV price weighting factor would equal (1 – 0.50), or 0.50. These weighting factors imply that this producer’s expected milk revenue will be weighted on 50% of the Class III price plus 50% of the Class IV price. When determining the price weighting factor, the Class III plus Class IV weights must equal 100% under DRP guidelines. Under the Class Pricing Option, a producer’s expected pay price is calculated by their weighted average Class III & Class IV price average over each month of the policy’s quarter. Figure 3 shows a hypothetical calculation for the expected pay price for Q4 2019 assuming a Class III weighting factor of 50%. Under the Component Pricing Option, the producer declares their butterfat and protein test pounds. The other solids test is fixed at 5.70 pounds per 100 pounds of milk. The elections of butterfat and protein test pounds allow a producer to establish coverage for prices that can accurately mirror their expected milk components. Under DRP guidelines, declared butterfat test elected can be no less than 3.50 pounds and no more than 5.00 pounds, in 0.05 pound increments. The declared protein test elected can be no less than 3 pounds and no more than 4 pounds, in 0.05 increments. Both declared components are subject to the component test ratio between butterfat and protein. 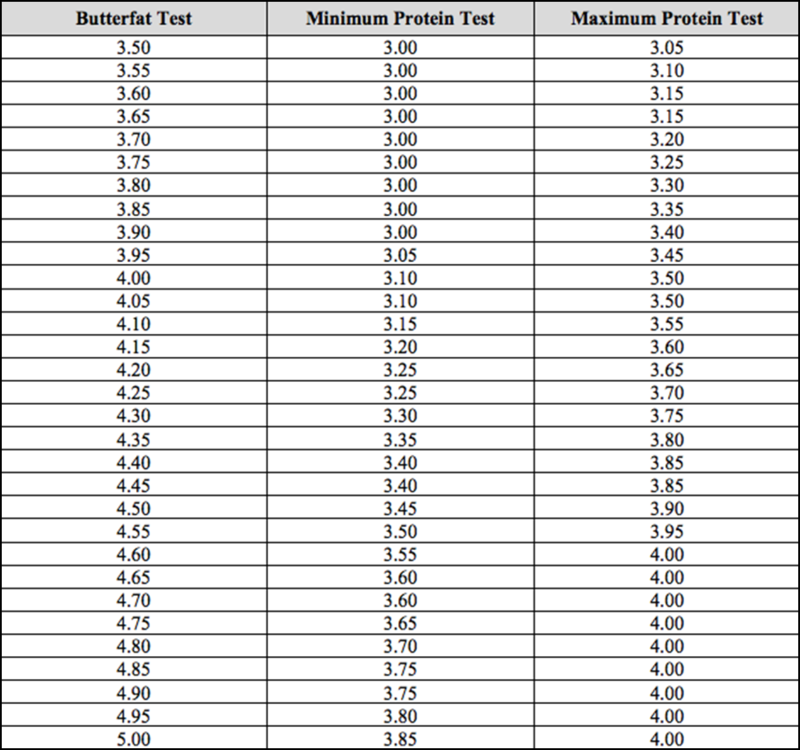 The declared butterfat to protein test ratio must be no less than 1.15 and no greater than 1.30, rounded to the nearest five hundredths (0.05). The minimum-maximum component ratios are illustrated in Figure 4. A producer using the Component Pricing option declares test values of butterfat and protein that are necessary to determine the expected total component milk price used to determine expected revenue and coverage. These producer elections using the Component Pricing option are shown in Figure 5. When determining the expected value of butterfat and protein, the average monthly value for each month in the insured quarter is calculated utilizing component futures’ prices and AMS component formulas. The total component price/cwt in Figure 5 represents an expected total component price for Q4 2019 assuming declared butterfat and protein test values of 3.60/3.10, respectively. If the component pricing option is elected, a producer’s coverage is based on their declared butterfat test and protein tests. However, to receive your full coverage, your average actual butterfat test and average actual protein test component levels for milk sold during the quarterly insurance period must not be less than 90 percent of the declared butterfat test or declared protein test. If either actual component test is less than 90 percent, then, as applicable, the final butterfat test and/or final protein test will be the actual determined test value percent divided by .90. For example, if the declared butterfat test is 5.00 pounds, the policyholder’s average butterfat test during the quarter must equal or exceed 4.50 pounds. If the actual butterfat test is 3.80 pounds, the final butterfat test will be 4.22 pounds (3.80 pounds actual / 0.90). For either actual component test that is at least 90 percent of the declared, then, as applicable, the final butterfat test and/or final protein test will equal the declared butterfat test or declared protein test. For example, if the declared protein test is 4.00 pounds, and the policyholder’s average actual protein test during the quarter is 3.80 pounds, the final protein test will be 4.00 pounds. Premiums will be due in accordance with the initial component calculations; any recalculation of component values will not result in a premium refund. Under DRP, a producer must elect a protection factor between 1.0 and 1.5, in 5% increments. It designed to provide greater flexibility in matching farm-level production risk. For example, if a producer declares a protection factor of 1.5 and receives an indemnity payout of $20,000, their final quarterly indemnity would equal $30,000, as $30,000 = ($20,000 x 1.5). The producer’s premium increases proportionally along with any indemnity, if one is paid out. Even if there is no indemnity payout, the producer must still pay the premium times their chosen protection factor. Each quarter upon the release of state-level milk production data by the USDA via Milk Production reports, a yield adjustment factor will be determined for producers based on actual vs. expected production yields in their state or pooled production regions. This yield adjustment factor is determined by dividing actual quarterly milk production per cow by the expected milk production per cow for that quarter. Both the expected and actual values represent a state or pooled production region yield data, not expected or actual yield for an individual operation. For example, if expected milk production per cow for a given quarter and state is 7,500 pounds and the USDA publishes actual milk production per cow of 7,800 pounds for that quarter and state, the yield adjustment factor would be equal to 1.04, as 1.04 = (7,800 ÷ 7,500). Similarly, if actual quarterly milk production per cow was 7,200 pounds, the yield adjustment factor would be 0.96, as 0.96 = (7,200 ÷ 7,500). From a practical standpoint, if the yield adjustment factor is above 1.0, then actual milk revenue is calculated higher and potentially above the threshold that would trigger an indemnity payment. Conversely, if the yield adjustment factor is below 1.0, then actual milk revenue is calculated lower thus reducing the threshold for triggering an indemnity payment. This holds true regardless of actual farm level production. In other words, the dairy’s actual production may be lower in a given quarter due to farm-level factors while the state or region’s milk production was higher than expected. It may also be true however that the dairy’s production proves larger than anticipated while the state or region’s actual production was lower than expected. If milk marketings during the quarterly insurance period are less than 85 percent of the declared covered milk production, then your total covered milk production for this quarterly insurance period shall equal your milk marketings divided by 85 percent. For example, two separate quarterly coverage endorsements purchased at different points in time for a single quarterly insurance period, endorsement A has 1,500,000 pounds of declared covered milk production and endorsement B has 500,000 pounds of declared covered milk production for a total of 2,000,000 pounds. The milk marketings are 1,200,000 pounds of milk for the quarter. The total covered milk production for all quarterly coverage endorsements shall be 1,200,000 pounds divided by .85, which equals 1,411,765 pounds. Premiums will always be due as calculated by your initial declared covered milk production, and they will not reduce because of any recalculations in covered milk production. This is important to understand as even though there is no maximum amount of milk production that can be insured, there is a disincentive to over insure since payments are ultimately determined by actual production, not declared production. 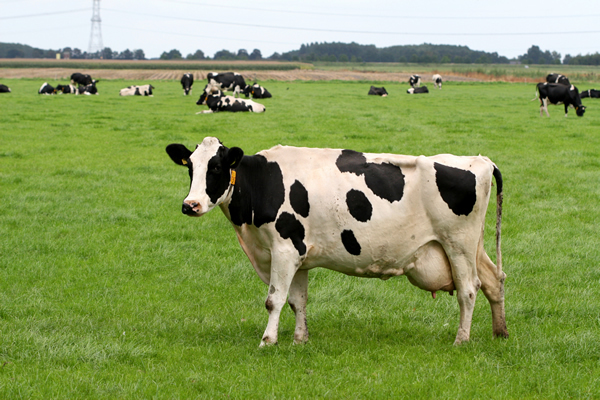 A producer’s declared share, or actual share, represents the percentage interest in the insured milk as an owner of the dairy operation at the time of the quarterly coverage endorsement. The premium paid and indemnity received adjust proportionally with the declared share of a producer. For example, if a producer owns 50% of the quarterly coverage endorsement under the DRP program, they only have to pay 50% of any premium costs, but will only receive 50% of any indemnity payouts. Dairy Revenue Protection represents a new opportunity for producers to address the very realistic risk of a significant and unexpected decline of future revenues and overall profitability. CIH embraces any new tool that offers the dairy industry an ability to protect against declining milk revenues and enhance overall profitability. Protecting revenue at a government-subsidized rate is especially attractive in low margin environments, particularly when premium costs are not due until the end of the period being covered. It is critical to assess how farm-level factors and features under DRP relate to your specific operation. CIH will work alongside your operation to create an integrated margin management policy that ensures you are properly hedged and able to take advantage of greater revenue opportunities if offered above the minimum level of your DRP. We encourage you to learn how a combination of risk management strategies can help you protect and enhance forward revenues and, ultimately, overall profit margins for your dairy operation. For any questions or to learn how this may specifically affect your dairy, contact CIH at 866-299-9333.